33 Shades of Green: Christmas Wrappings. . .
Every year I try to come up with a different and unique idea for wrapping my Christmas gifts. Last year I was inspired by a Christmas shopping bag from Pottery Barn the year before. I cut the bag apart at the seams so that I had one large piece and took it to Kinkos and had it copied several times on 11" x 17" size paper. First, I wrapped the gifts in plain brown kraft paper. It's very inexpensive and can be found in the office supply section at most stores. 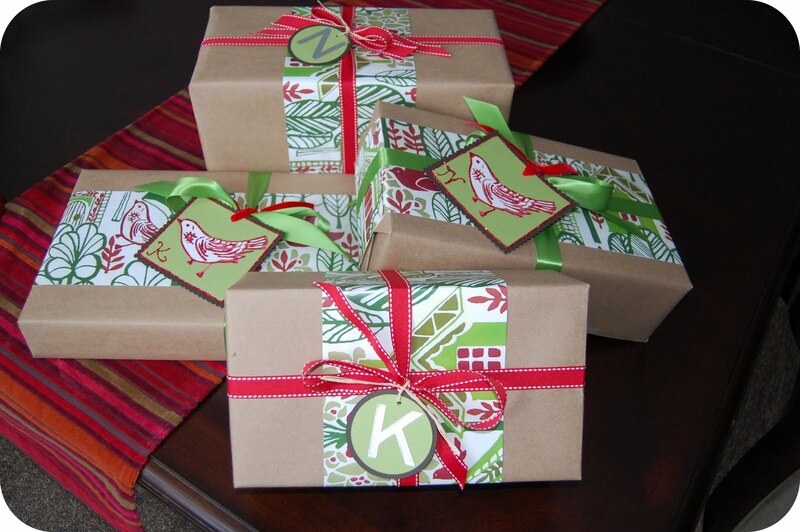 Then I took the copied sheets of patterned paper and wrapped around the center of each gift. 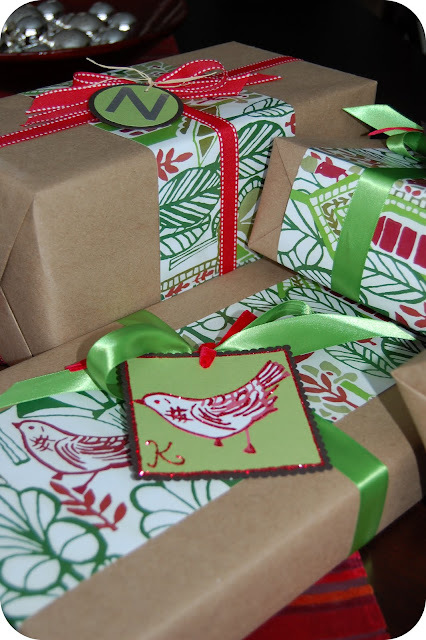 I made little bird gift tags by cutting a bird out of the patterned paper and gluing it on a piece of cardstock. Then I outlined the bird with a fine line of glue and applied glitter. It's hard to tell from the photo, but the red of the bird is all glitter. I was really happy with how the gifts turned out. I haven't come up with any ideas yet for this year! I'm hoping to come up with something soon! Last year's wrapping was really good, I loved the little bird, I still have mine of course! The holiday season is fast approaching and you do not want to be stuck doing your shopping last minute. Educational toys are a great gift to give to any child because they can have fun while learning at the same time! I love your packages, it really inspired me for this Christmas. Thanks so much for sharing this idea! 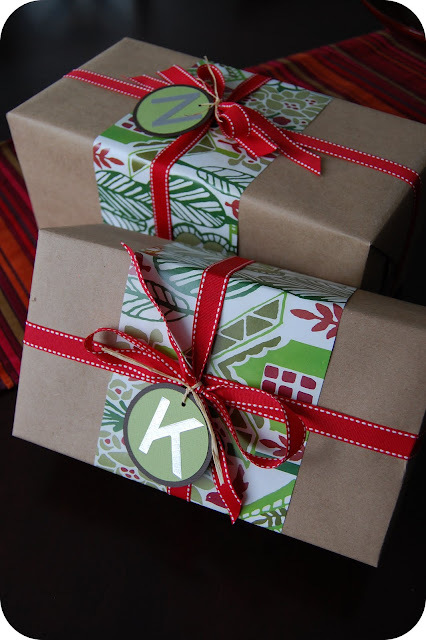 Each Wednesday until Christmas I'm sharing different ways to wrap presents. Today, I showed your idea and linked back to your blog. Thanks! So lovely! That's a genius idea to use the pattern from the bag, and wrapping it in bands around the gifts makes so much sense. Thanks for sharing with us! Thanks so much for sharing this idea! 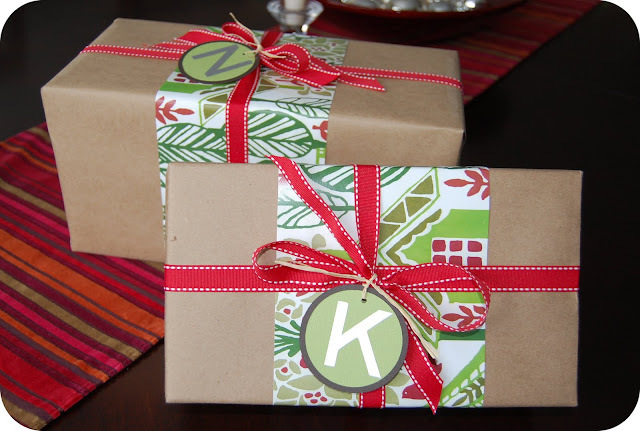 Each Wednesday until Christmas I'm sharing different ways to wrap presents. Today, I showed your idea and linked back to your blog. Thanks!architect washington dcwhy suffer fromk anxiety? Very pretty. Doing this this year for sure!